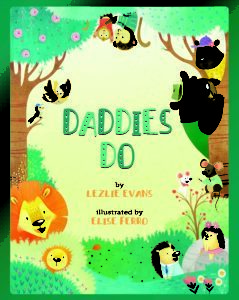 Happy Book Birthday to Daddies Do by Lezlie Evans! Lezlie Evans’ latest picture book DADDIES DO published today with Sterling to some nice reviews! From a tiny mouse to a lion cub, adorable animal children explain why daddies are the BEST! Who wrestles with you for fun—but then surrenders and says you’ve won? Who takes you on outings and just doesn’t care what outfit you’re wearing or if you’ve got messy hair? Guess who? DADDIES DO! Meet a delightful group of animal daddies, including a bird who teaches his baby to fly and a polar bear who gives his cub the best hugs. This perfect Father’s Day story ends with every dad tucking his child in with a sweet good night. Lezlie Evans is the award-winning author of numerous picture books, including Can You Count Ten Toes? (Houghton Mifflin Harcourt) and Finding Christmas (Albert Whitman). Scholastic Book Clubs/Fairs has picked up several of her titles, including Rain Song and Snow Dance (both Houghton Mifflin Harcourt), and The Bunnies’ Picnic(Disney/Hyperion). Lezlie is an avid speaker and proponent for early childhood literacy, and a member of the Children’s Book Guild of Washington, DC. The inspiration for Daddies Do came from watching her six children wrestle, read, and eat pancakes (minus the ants) with their daddy. She lives in Ashburn, VA.
You can pick up a copy at Amazon, Barnes & Noble, IndieBound and your local bookstore! You can follow Lezlie on Instagram and go to her website! Check out the DADDIES DO book trailer here!